We are offering HDPE Grow Bag to our clients. Abiding by all the norms and quality standards, we are engaged in offering PlantGrow Bag. Vedika Infracon Opc Pvt. Ltd. Growing bags are ideal for plants that don't have deep roots, such as tomatoes, cucumbers, sweet peppers, chilli peppers, aubergines and courgettes. Plant two to three plants in each bag during spring. Alternatively, cut a long panel in the top of the bag and sow salads in rows. 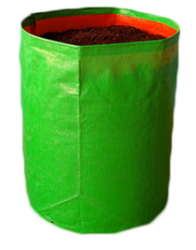 We are one of the most reliable companies in this domain and are into offering HDPE Grow Bag. Green Round/Rectangular UV Stabilized Grow Bags, Size: 9x9"
• Size: 7" x 7" x 6"
We are offering Packaging UV Stabilized Grow Bag to our client. 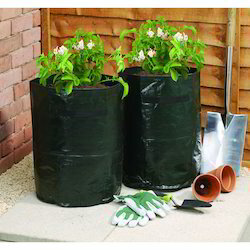 Grow bags are ideal for balcony or small gardens, where space is a premium and you don’t want to be fiddling around with dirt. These grow bags are extremely strong and UV Stabilized, which are widely used to grow all types of plants. These bags can last for more than 5 years under constant use while resisting harsh sunlight.